Build a house in the game Minecraft - a fascinating process. If you apply imagination and patience, you can create a masterpiece. Properly designed floors in the house adds comfort to him. When building a house you need to consider that one unit of its height is floors. Therefore, walls should be built as with the zero level, it is necessary to take into account when marking the space under the Windows and doors. For the floor best suited to conventional wooden boards. The game features seven types of wood. They can be combined, achieving a decorative effect. Building a frame home, count how many blocks you will need on the floor. For this (if your house is the right shape), it is sufficient to multiply the length by the width. If you are going to do a two - or three-storey house, respectively, just increase the number. From one block of wood turns into four boards. That's what makes the Board so common in the construction material. Find the trees, get as many blocks of wood, it is better to use the axe because it speeds up the process of getting blocks. If, during logging, drop the seedlings, just plant them, so that in the future not to remain without wood. Think about the pattern which you want to create from the boards. In principle, even single-color wooden floor looks so much more comfortable layer of stones or of earth, but chess and other patterns of contrasting wood look even better. It is best to use two or three types of boards. If you want to make your home more comfortable, you can decorate the floor with carpets. They are easy to make from wool. For the creation of three carpet you will need two units of wool. It can be obtained from sheep. If you have scissors, these animals can simply be cut without killing. So you get a few blocks of wool from each sheep, besides, after some time they again grow. If scissors or iron bars, from which you can make this tool, you do not, the sheep just to kill. From each sheep in this case will drop one block of wool. Wool can be painted in a custom color, using dyes, which can be obtained from the flowers and some minerals such as lapis lazuli. For this you need to put the wool and the dye selected in the area of crafting (create items). A small area of the craft (two by two cells) there are in game, but you can use a workbench, which you can create objects larger (three by three cells). To make the rug, place in the field of crafting on the same horizontal two-color wool block. 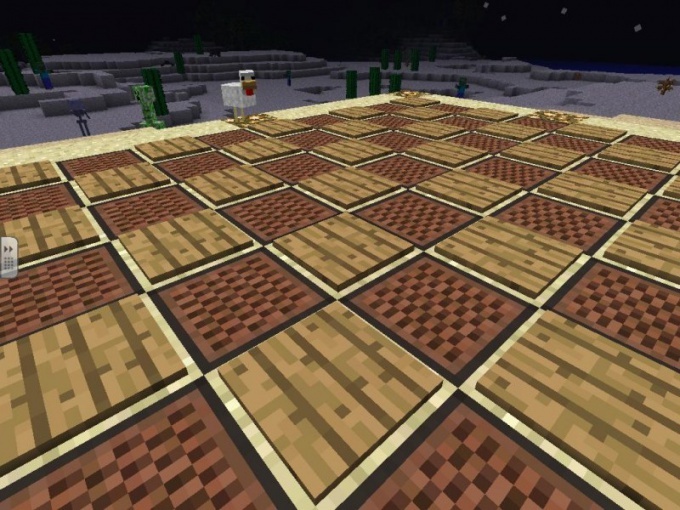 The resulting rugs can be placed on any surface, for example on the wooden floor. With the help of several colorful rugs can create an interesting decor.